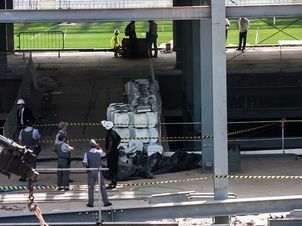 The worker Fabio Hamilton Cross, 23, died Saturday, hours after dropping one of the temporary grandstands at the Corinthians Arena, in Itaquera. This is the third death registered at the stage for the World Cup opening match and eighth in total deaths in construction in stadiums built for the World Cup. The police investigator responsible for the case, Rafael Pavarina, of 24th DP in the Rasa Bridge neighborhood in Sao Paulo, said the reports heard by colleagues of the victim were “overconfident” of the worker, not wearing the proper security equipment. In the UOL website, however, witnesses said Hamilton had the cable on but had not held properly. The expert said he fell eight meters and that had the bell unattached”, said Pavarina. ” Now we’ll investigate if he was wearing the right equipment. The two coworkers, William and David Barbosa da Silva, will testify in the coming days. They were in the same structure which Fábio plummeted. In a statement, the WDS Construction, Engineering outsourcing company by Fast and employer Fabio, confirmed that the officer had all the safety equipment available – Fast is the company responsible for building the temporary bleachers Arena. O operário Fábio Hamilton da Cruz, 23 anos, morreu no sábado, horas depois de cair de uma das arquibancadas provisórias da Arena Corinthians, que segue em obras em Itaquera. Esta é a terceira morte registrada na obra do palco de abertura da Copa do Mundo e a oitava no total de mortes em obras nos estádios construídos para a Copa. Os dois colegas de trabalho, William Barbosa e David da Silva , deverão prestar depoimento nos próximos dias. Eles estavam na mesma estrutura da qual Fábio despencou. Em nota oficial, a WDS Construções, empresa terceirizada pela Fast Engenharia e empregadora de Fábio, confirmou que o funcionário tinha todo o equipamento de segurança à disposição – Fast é a empresa responsável pelas obras nas arquibancadas temporárias da Arena. o secretário-geral da Fifa, Jérôme Valcke, lamentou a morte do operário no estádio corintiano.